Also Recommended: Blood C, Umineko no Naku Koro ni, Yami to Boushi to Hon no Tabibito. Notes: Originally a murder mystery doujin soft sound novel series produced by 07th Expansion. Going from cute and sweet to viscerally disturbing is not uncommon ground for Japanese media. Anyone who has had the... 'pleasure' of seeing the Miike Takashi film, Audition, knows that contrasting these two things is not something unique to Higurashi in any way, shape or form. It is especially appropriate to find it in animé though, considering the 'culture of cuteness' that exists within our beloved medium's four narrow walls, and it was about time that a show came and did it as well as this one does. In fact, the whole dichotomy of cute versus disturbing is ultimately a sideshow for Higurashi, even after the shock of moé murder washes away there remains a well-delivered, competent story, a fascinating plot and a setting filled with real charm, populated by interesting and occasionally empathetic characters. Overall, there is something delightful about the series that I never would have expected... when I overlook the violent killing, of course. The first point of interest is the narrative style. Higurashi does not run a conventional, chronological story arc nor does it run episodically. 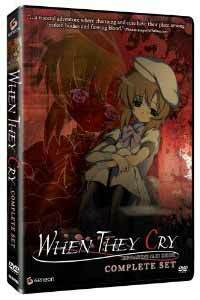 Higurashi splits into what are essentially six linked stories that usually involve all the same characters. The first story arc runs for four episodes before coming to a (definitive) resolution and then the second story arc begins where the first one began but follows a distinct run of events to a distinct conclusion. Facts about the characters and village remain the same but things play out differently as slightly different actions lead to different choices and different situations, etc. It reminds me of some visual novels where early choices in the game can lead to wildly different endings and events occurring. I have complained about the poor or average use of this style of narrative (Yosuga no Sora and Amagami SS, respectively) but Higurashi brings this style of independent stories to its proper use: they build on each other. While other attempts are choppy and uneven or lack depth from being too short or too independent, the six stories found in Higurashi (and the other stories found in its sequel Kai) essentially tell one story split into many different jigsaw pieces. I'm not going to pretend this is unique, it's an interesting take on the Rashomon idea (watch that film, seriously), but Higurashi does it so competently - giving snippets of important information out amongst the circumstantial exposition found in each story, many of which I only spotted on my second run through. This does mean that the series does come across as a little threadbare during the opening arcs, with a bit too much repetition in its attempts not to confuse everyone, but it is a series that really starts to build up steam as the show's central mystery becomes more and more real though not that much more obvious. Another point of praise must go to the characterisation. It is an odd thing to commend considering that I didn't view most of the characters as particularly deep even when I got over the fact that they are styled after moé archetypes, the same ones that act as the cute counterpoint to the series' overall bloodiness. No, the characters of Higurashi mostly act functionally - are easy to recognise and fill the roles that they are happily set - but here is where Higurashi again uses its tools well. Even though I say that they aren't particularly deep, there is depth there that is put to good use. The main characters have clear, interesting and sympathetic histories and challenges that the series reveals expertly to allow a certain amount of personal resonance for the viewer. Compounded with the effectiveness of the violence, I felt a moderate degree of investment - the violence and the tragedy arriving with personal relevance rather than feeling like a feat of voyeurism. The third, fifth and sixth arcs are the most effective in this respect. It's not going to bring you to tears of joy or pain (though some of the violence might make your eyes water) but it's effective and raises the series above the rank of an interesting brainteaser to the heights of being a well-rounded and entertaining show, in general. It certainly has faults though. One person I know commented that the first episode of each arc is terrible and there is some truth in that. The show's attempts at comedy are lacklustre at their best and the show really doesn't have the visuals to pull of the slice-of-life routine even in a pretend or mock fashion. Apparently, there is a market for the humour (part of Rei and all of Kira consist of it) but it certainly doesn't include me and if that is the sort of thing that you really want then I suggest looking elsewhere - the show is definitely at its best when it is at its darkest. Of course, I see the point, the show means to be all the more shocking with its mood-induced whiplash but it doesn't change the fact that the humour isn't funny and no longer effective when you know what's coming anyway. That aside, animation remains on the usual Studio DEEN standard of being terrible and the now famed (or infamous) 'Higurashi Faces' (the distorted faces the characters make when they go nuts) are neither disturbing nor effective and come across as a bit stupid most of the time. Happily, not one of these things are deal-breakers and even a stupid face here and a bit of hack animation there cannot take away from a series that delivers such strong, all round entertainment for anyone who can stomach it. It's true that I didn't love the series, it had a slow start and it never astounded me with any of its strengths but it works. It has a good central mystery that stands up to multiple viewings (despite not being as mind-bending as some shows) and enough in the way of interesting characters and well-paced plotting that even knowing the end still allows for a quality viewing experience that there is potential to invest in. Recommended Audience: ABSOLUTELY NOT FOR CHILDREN. 18 and up due to explicit, onscreen violence, torture, and some gore. While not as detailed as Gantz or Elfen Lied, the juxtaposition of this with the setting and character designs makes it arguably more unsettling. Yes, it's a cartoon, but any show involving a schoolgirl mutilating herself to death is pretty amazingly harsh stuff.